1) This paper was presented at the FIG Working Week in Sofia, Bulgaria, 17-21 May 2015. The paper presents results of analysis of atmospheric characteristics (temperature and moisture) in the Australian region using Global Navigation Satellite System (GNSS) ground-based meteorology and space-based radio occultation (RO) techniques verified with in-situ radiosonde measurement. This paper presents results of analysis of atmospheric characteristics (temperature and moisture) in the Australian region using Global Navigation Satellite System (GNSS) ground-based meteorology and space-based radio occultation (RO) techniques verified with in-situ radiosonde measurement. Ground-based GNSS and Global Positioning System (GPS) meteorology has long offered the prospect of complementing meteorological observations by providing integrated vertical column of Precipitable Water Vapour (PWV) profiles. One of the most valuable attributes of ground-based GPS-PWV is the ability to provide high temporal and accurate PWV estimates under all weather conditions, including cloud cover and precipitation. Here we present results of deriving PWV using Australian ground-based GPS reference stations network and investigate potential of using ground-based GPS technique for measuring PWV. A good agreement of PWV estimates was found between GPS and radiosonde measurements with a mean difference of less than 0.1 mm and standard deviation of 3.5 mm using five year of GPS data. Space-based instruments provide wider (potentially global) coverage than regional ground-based networks. One emerging satellite remote sensing technique for obtaining atmospheric temperature and moisture records is GPS RO which provides all-weather capability, long-term measurement stability, high vertical resolution and high-accuracy measurements in the middle to upper troposphere, stratosphere and ionosphere. High accuracy of the GPS RO methodology is of particular importance for reliable estimates of the atmospheric characteristics over regions where conventional meteorological upper air observations from radiosondes are sparse or not available. 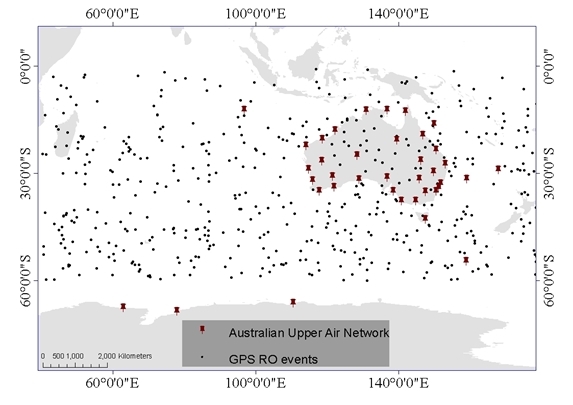 Here we present analysis of vertical distribution of atmospheric temperature over data space areas in the Australian region derived from GPS RO observations. Detailed comparison between GPS RO and RS data over a five year period demonstrated that temperature differences are <2°C in a range of altitudes between 10 and 15 km. Conventional observations of atmospheric characteristics (temperature and water vapour) are collected daily at thousands of meteorological stations around the world, to be used for weather analysis and forecasting. Subsequent statistical analysis of the archived data over long-term period (decades and longer) allows derivation of plausible conclusions about climate (average state of weather) based on instrumental records obtained at ground-based and upper air meteorological stations. Conventional observations are well established and archives of meteorological variables recorded at many stations worldwide go back for more than a century. Such continuity of records is crucial for climate research, detection of historical trends in the variables etc. However, conventional records are restricted to locations of meteorological stations. In modern time, data obtained by optical, infrared, radio- and micro-wave remote sensing instruments revolutionised atmospheric research as they provide potentially global coverage and consequently improved access to areas which have limited number of meteorological stations (data sparse areas). Remote sensing data complement conventional observations and are widely used today in numerical weather prediction, for climate monitoring and analysis adding value to and improving skill of weather forecasts, accuracy of trend analysis of meteorological variables etc (Bennitt and Jupp, 2012, Boniface et al., 2009, Means and Cayan, 2013, Yan et al., 2009). It is of particular importance for meteorological and climatological applications in the Southern Hemisphere where observation stations are much less in numbers than in the Northern Hemisphere. Global Satellite Navigation Systems (GNSS) such as the U.S. Global Positioning System (GPS) technology has evolved and emerged as a powerful atmospheric remote sensing tool for providing accurate observations of atmospheric parameters. In this paper, we present results of analysis of atmospheric characteristics in the Australian region using the data obtained by ground- and space-based techniques, which utilise radio signals of GPS. Rather than competing, these two techniques are complementary. Atmospheric water vapour is a critical component of the greenhouse effect and plays a significant role in the global climate system. The knowledge of the long-term spatial and temporal variability of water vapour is vital for understanding climate change. Ground-based GPS has long offered the prospect of complementing meteorological observations by providing integrated vertical column of Precipitable Water Vapour (PWV) estimates. One of the most valuable attributes of ground-based GPS meteorology technique is the ability to provide high temporal and accurate PWV estimates under all weather conditions, including cloud cover and precipitation. 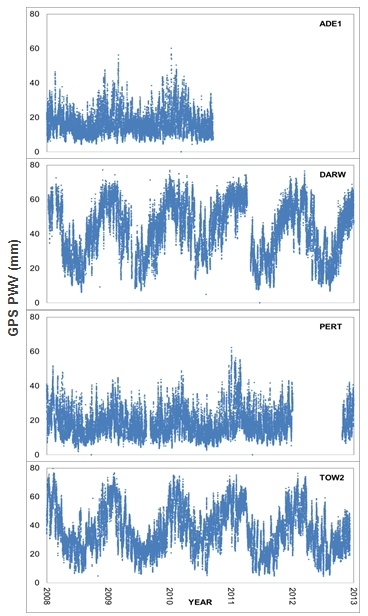 Here we present results of PWV estimates using data from the Australian ground-based GPS reference stations network to investigate the prospect of using ground-based GPS meteorology technique for monitoring PWV trends. Space-based instruments provide even wider (potentially global) coverage than regional ground-based networks. One emerging satellite remote sensing technique for obtaining atmospheric temperature and moisture records is GPS radio occultation (RO) which provides all-weather capability, long-term measurement stability, high vertical resolution and high-accuracy measurements in the middle to upper troposphere, stratosphere and ionosphere (Heise et al., 2008, Liou et al., 2007, Pavelyev et al., 2013). High accuracy of the GPS RO methodology is of particular importance for reliable estimates of the atmospheric characteristics over the regions where conventional meteorological upper air observations from radiosondes are sparse or not available. Here we present analysis of vertical distribution of atmospheric temperature over data space areas in the Australian region derived from GPS RO observations. GPS has long offered the prospect of retrieving column integrated PWV profiles from the time-varying tropospheric Zenith Path Delay (ZPD), which can be retrieved from GPS measurements. In 1992, Bevis et al. was the first to devise innovative methods, now known as ground-based GPS meteorology, for retrieving atmospheric water vapour profiles from the GPS signals as they propagate through the atmosphere (Bevis et al., 1992). Geodesists have, for a decade, treated the effects of the atmosphere as noise parameters that need to be removed from the data for the process of estimating positions. However, Bevis et al. (1992) proposed that this delay could be parameterised in terms of a time-varying total tropospheric delay. If surface temperature and pressure observations at the GPS receiver are known to sufficient accuracy, tropospheric delay can be converted into accurate estimates of the total zenith column water vapour, termed PWV. Here, PWV means the height of an equivalent column of liquid water (unit: mm). As a first step, we present a regional quantitative analysis of GPS-PWV focusing on four Australian Regional GNSS Network (ARGN) stations (Geoscience Australia, 2008) over a five-year period (2008 – 2012). The selected four GPS sites sample quite different climate conditions across Australia. DARW and ADE1 are located near 13° S and 35° S, respectively. All GPS sites are located relatively close to the coast (see Figure 1). These stations were selectively chosen to provide a representative regional distribution of GPS sites with varying climates while ensuring conventional meteorological observations such as surface-based data are available for PWV conversion and other PWV sensors, e.g., upper-air data from radiosondes, for validation purposes. The ARGN stations have been built up progressively since the 1990s, which has the potential to provide at least 15 years of GPS derived PWV estimates. The motivation of this analysis work is to validate the computation strategy used to process GPS data and conversion to PWV estimates given surface pressure and temperature readings. The ultimate goal of this study is to use the data to investigate seasonal variability and trends of PWV in Australia and its implications for climate research and applications. Figure 1: A Google Earth map showing locations of the four Australian GNSS sites. ADE1-Adelaide, DARW-Darwin, PERT-Perth, TOW2-Townsville. To validate the accuracy of the computed ZPD estimates, the values were compared to the International GNSS Service (IGS) Final ZPD products generated by United States Naval Observatory (USNO) (IGS, 2014). Table 1 shows the statistical results for the 2011 comparison along with the number of records being compared (note that no GPS data were recorded at ADE1 GPS station in 2011 and 2012.). The statistics were computed based on the differences between our computed and the IGS estimates. A comparison was made when there was a record and epoch match that is no interpolation was made for comparison. Our ZPD estimates are quite consistent to those of IGS with an average standard deviation of 3.8 mm, indicating that both techniques provide estimates of comparable accuracy. This level of agreement aligns with previously published results (Byram and Hackman, 2012). Table 1: Average differences (unit: mm) between the computed ZPD estimates. Note that no GPS data were recorded at ADE1 in 2011. To convert the derived ZPD from GPS measurement to PWV, accurate pressure and temperature readings are required. In this study, pressure and temperature recordings from the nearest synoptic stations (within 50 km of the GPS site) were obtained from the Australian Bureau of Meteorology (BOM) data archive. Gutman et al (2003) concluded that the synoptic stations within 50 km of a GPS station could be used to derive surface pressure at the GPS site with about 0.5 hPa bias. An error of 0.5 hPa in the pressure measurement will cause an error of 1 mm in the estimated ZWD (Coster et al., 1997), and subsequently an error in the PWV estimates of about 0.2 mm (Hagemann et al., 2003). Radiosondes are the primary operational source of upper air observations including temperature, pressure and moisture. Radiosonde flights are usually released twice a day (e.g. 11:00 UTC and 23:00 UTC). A radiosonde flight ascends to 2 km in 7–8 minutes and reaches 5 km in about 20 minutes after the launch. Although radiosondes can provide meteorological observations with good vertical resolution, the temporal and spatial variability of the GPS-PWV is not significant. However they are a good source of independent validation data and are often used as a source of information for validating GPS-PWV datasets. The approximate lateral distances and height differences between the GPS and radiosonde sites are listed in Table 4. Table 2: Approximate lateral distances (km) and height differences (m) between the GPS and radiosonde (RS) sites. Estimates of GPS derived PWV and radiosonde measurements of PWV were compared over the 5-year period. Figure 2 shows a summary of comparison for each year starting from 2008 to 2012. The mean values were computed based on the average differences between radiosonde measurements of PWV with GPS, i.e., ‘radiosonde minus GPS’. The mean difference is an indication of systematic bias between the two instruments. In general, the two instruments are in good agreement with a small mean difference of less than 1 mm. TOW2 displays the largest mean bias of -1.5 mm amongst the sites and the bias is fairly consistent across the five-year period. A closer inspection of this site revealed significant changes in the mean difference depending on the time of radiosonde launch, e.g., day/night differential behaviour. At 23 UTC (11 am local time), the mean difference is -1.5 mm; while at 11 UTC (9 pm local time), the mean difference is 0.9 mm. This may be a result of the dry biases in the Vaisala instrumentation (Wang et al., 2007). The larger dry bias during daytime is primarily caused by the solar radiation heating of the humidity sensor (Vomel et al., 2007). The standard deviation can be interpreted as the spread of the PWV differences or variations from the mean. Sites showing relatively larger standard deviations (> 3 mm) of PWV differences are stations located in the northern part of Australia, such as DARW and TOW2, where atmospheric moisture is the highest. The comparison statistics seem to also suggest that the extent of the standard deviations of the PWV differences is associated with the magnitude of PWV values. As the PWV estimates increase in values, so do the standard deviations of the differences between GPS and radiosonde PWV estimates. DARW and TOW2 sites show similar characteristics. A mean difference between the GPS and radiosonde PWV estimates over the 5-year period for all the sites is 0.1 mm with a standard deviation of 4.0 mm. 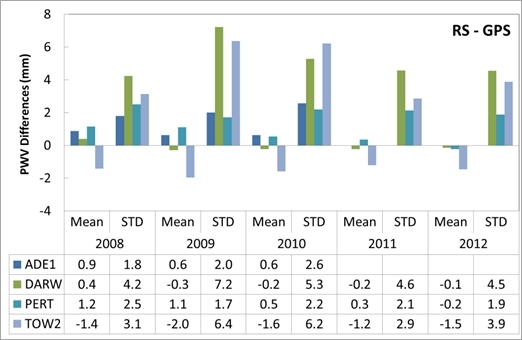 Figure 3 shows the 5-year absolute GPS-PWV estimates as time series. A good agreement of PWV estimates was found between GPS and radiosonde comparison with a mean difference of less than 0.1 mm and standard deviation of 3.5 mm. It can also be seen that the spatial and temporal variability of PWV concentration in the atmosphere depends on the season, topography and other local/regional climate conditions. The time series display strong annual variation in PWV at all sites, with distinctive peaks (higher values) and dips (lower values) occurring approximately in the austral summer and winter, respectively. The range of PWV in Australia is between 0 mm to 80 mm. PWV values at stations located in the northern part of Australia, e.g., DARW and TOW2, show larger variation in PWV amplitude on the basis that warm air holds more moisture and cold air is drier. The variation and magnitude of PWV is typically less at higher latitudes; while the variation along the longitude is not as significant as in the latitude. Detailed analysis of these trends will be further conducted. Figure 2: Comparison between radiosonde measurements of PWV (mm) and GPS. Figure 3: PWV estimates from 2008 – 2013 at ADE1, DARW, PERT and TOW2 GPS stations. The Y-axis denotes GPS derived PWV (mm) and the X-axis denotes the year. The Australasian region is highly important in terms of impacts on weather and climate of the Earth yet it is not sufficiently covered by meteorological observations. The region is significant in meteorology because it is considered the most important energy source region in the entire global circulation system owing to a number of coincident factors. The most significant being geographic location and topography, both of which contribute to the development of the warmest large area of ocean on Earth, the Tropical Warm Pool. This is a region of intensive ocean/atmosphere interaction with widespread convection and environment favourable for Tropical Cyclone (TC) development. El Niño–Southern Oscillation (ENSO), a coupled ocean-atmosphere phenomenon in the central Pacific, is another significant climate driver of the planet, which causes extreme weather (such as floods and droughts) in many regions of the world. Consequently, accurate knowledge about state of the atmosphere over the Pacific Oceans are vital for understanding the ENSO and their impacts on climate of the Australasian and other regions of the planet. To analyse the state of the atmosphere in this region, we used GPS RO data from FORMOSAT-3/COSMIC (F3C) mission. F3C is the first GPS RO mission that employs a satellite constellation for RO observations and the constellation consists of six Low Earth Orbit satellites (Liou et al., 2007, Pavelyev et al., 2007). F3C was launched in 2006 and the constellation is currently operational providing a large number of daily observations. GPS RO data from F3C constellation were obtained from COSMIC web site http://www.cosmic.ucar.edu/. We analysed GPS RO temperature and moisture profiles obtained by F3C constellation over the continent of Australia and nearby oceans. The left plot in Figure 4 shows the location of the Australian region radiosonde sites, and the right plot shows a daily sample of GPS RO events. On average, the Australian region obtains around 300 RO events daily which is more than a number of atmospheric profiles that the radiosonde stations could provide. Verification of GPS RO atmospheric profiles using RS data has been conducted in a number of studies for various regions (Fu et al., 2007, Kuo et al., 2005). 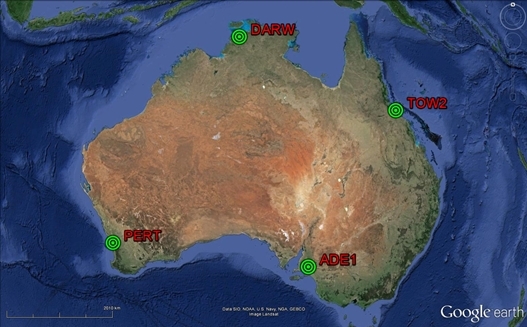 Figure 4: Locations of the Australian upper air radiosonde stations and a daily sample of GPS RO events over the Australian region. We compared F3C RO temperature profiles obtained over the Australian continent and Pacific Ocean with RS data. 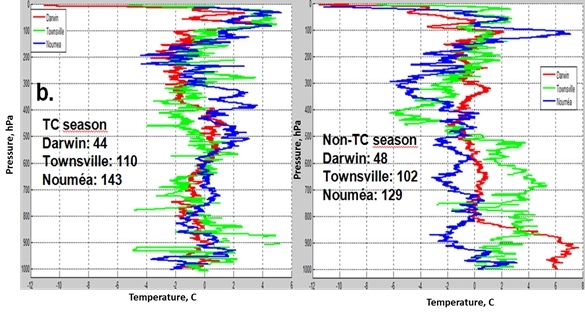 Data from three selected stations were identified, i.e., Darwin, Townsville and Nouméa. Five years of RS data (2006-2010) have been compared with GPS RO events selected to satisfy criteria of (i) spatial collocation to be within 300 km radius from geographic position of the meteorological site, and (ii) temporal collocation to be less than 3 hours before or after the time of RS launch. The number of compared profiles was similar for RS and GPS RO events at almost all sites and was approximately evenly distributed between TC seasons (November to April) and non-TC seasons (May to October). Tropical air over the Australian region is generally warm and moist. However, there is a distinct seasonality. We stratified the observations between TC seasons (November to April) and non-TC seasons (May to October). In the Southern Hemisphere, November to April is a wet season and May to October is a dry season; this is translated into significant difference in distribution of atmospheric moisture and temperature. The number of profiles was approximately evenly distributed between TC and non-TC seasons. Good agreement between GPS RO and RS temperature profiles has been found at all stations, especially in the lower stratosphere and the upper troposphere (Figure 5). Detailed comparison between GPS RO and RS data demonstrated that temperature differences are <2°C in a range of altitudes between 10 and 15 km. Figure 5: Comparison between RS and GPS RO profiles during the Southern Hemisphere TC season (November to April, left) and non-TC season (May to October, right). The Y-axis denotes pressure in hectopascal (hPa) and the X-axis denotes temperature in degrees Celsius (C). The success of GPS has encouraged further development of GNSS systems. GLONASS (Russian Federation) is another currently operational satellite positioning system. The system has 24 satellites in orbit. Countries of the European Union proposed their own GNSS system (Galileo) and it has been designed as a service-oriented positioning system. Six operational satellites are currently in orbit and full completion of the 30-satellite Galileo system is expected by 2020. The QZSS system is a Japanese regional augmentation system and will have three additional satellites by 2018. The first QZS-1 was launched in 2010. The QZSS satellites will fly over Japan, Eastern Asian and the Australian regions and will provide better opportunities of utilising GNSS RO for these regions. China has launched 16 BeiDou satellites (as of August 2014) to establish its own GNSS system. The Chinese system will have 35 satellites in total in different earth orbits to provide a global coverage. It has great potential and will be considered for our future research on application to climate studies in the Australian region. We analysed the number and distributions of the RO events in the Australian region from F3C and its successor, FORMOSAT-7/COSMIC-2 constellations with multiple GNSS systems (i.e. GPS, GLONASS, Galileo and QZSS). Over 3,000 daily atmospheric profiles in the Australian region can be expected from the FORMOSAT-7/COSMIC-2 constellation after launch of six satellites in low-inclination orbits planned for 2015 and another six satellites into high inclination orbits in 2018. The largest increase in a number of RO events is expected between the equator and 30 degrees latitude (North and South), which will significantly contribute to enhancement of TC research and observations. In this paper on recent progress in advancing climate studies in the Australian region we demonstrated that GPS satellites and ground-based measurements are valuable data source of meteorological parameters. We presented examples of analysis of distribution of atmospheric temperature over the continent of Australia and the Pacific Ocean from GPS RO observations and noted high accuracy of remote sensing data verified using conventional RS measurements. We also evaluated potential of the Australian regional network of GPS stations to estimate atmospheric water vapour content. The study demonstrated that GPS-derived PWV values are of high accuracy and could be used for long-term regional reanalysis of the Australian climate. In the future, with further expansion of GNSS system, it is expected that GPS satellite- and ground-based measurements even further advance studies on climate analysis and monitoring. Ground-based GPS meteorology and space-based RO techniques have been recognised as an emerging technique for Earth’s atmospheric observation. Atmospheric temperature profiles derived from GNSS RO observations provide valuable information about state of the atmosphere over the oceans where upper air data from conventional meteorological observations are particularly scarce. With the recent GPS modernisation and new global and regional GNSS systems in the near future, next generation RO missions will have opportunity and capability to utilise signals from more than a hundred of GNSS satellites. Thus, the resolution, quantity and quality of the GNSS RO observations will be improved significantly and the data will have significant impact on improving accuracy of weather forecasting and climate studies. Similarly, analysis of long-term data from GPS ground-based stations (e.g. the Australian regional GNSS network) will provide accurate estimates of variability and trends in atmospheric moisture, which in turn will improve our understanding of the regional climate processes. This work was partially supported by the RMIT Foundation and the Malcolm Moore Industry Research Grant. The authors would also like to thank the two anonymous reviewers for their helpful suggestions to improve the manuscript. BENNITT, G. V. & JUPP, A. 2012. Operational Assimilation of GPS Zenith Total Delay Observations into the Met Office Numerical Weather Prediction Models. Monthly Weather Review, 140, 2706-2719. BEVIS, M., BUSINGER, S., HERRING, T. A., ROCKEN, C., ANTHES, R. A. & WARE, R. H. 1992. GPS Meteorology: Remote Sensing of Atmospheric Water Vapor Using the Global Positioning System. Journal of Geophysical Research, 99, 787-801. BONIFACE, K., DUCROCQ, V., JAUBERT, G., YAN, X., BROUSSEAU, P., MASSON, F., CHAMPOLLION, C., CHERY, J. & DOERFLINGER, E. 2009. Impact of high-resolution data assimilation of GPS zenith delay on Mediterranean heavy rainfall forecasting. Annales Geophysicae, 27, 2739-2753. BYRAM, S. M. & HACKMAN, C. Troposphere Product by the USNO. IGS Workshop, 23-27 July 2012 Olsztyn, Poland. COSTER, A. J., NIELL, A. E., SOLHEIM, F. S., MENDES, V. B., TOOR, P. C. & LANGLEY, R. B. The Effect of Gradients in the GPS Estimation of Tropospheric Water Vapor. The ION 53rd Annual Meeting, 30 June - 1 July 1997 Albuquerque, New Mexico. FU, E., ZHANG, K., WU, X., MARION, K. & REA, A. 2007. An evaluation of GNSS radio occultation technology for Australian meteorology. Journal of Global Positioning System, 6, 74-79. GEOSCIENCE AUSTRALIA. 2008. Australian Regional GPS Network [Online]. Available: http://www.ga.gov.au/geodesy/argn/ [Accessed January 2008]. GUTMAN, S. I., SAHM, S. R., STEWART, J., BENJAMIN, S., SMITH, T. & SCHWARTZ, B. A new composite observing system strategy for ground-based GPS meteorology. the 12th Symposium on Meteorological Observations and Instrumentation, AMS, 2003 Long Beach, CA. HAGEMANN, S., BENGTSSON, L. & GENDT, G. 2003. On the Determination of Atmospheric Water Vapor from GPS Measurements. Journal of Geophysical Research, 108, 4678. MOZAIC Aircraft Measurements. IEEE Transactions of Geoscience and Remote Sensing, 46, 3406 – 3411. IGS. 2014. International GNSS Service [Online]. Available: http://igscb.jpl.nasa.gov/ [Accessed January 2014]. KUO, Y. H., SCHREINER, W. S., WANG, J., ROSSITER, D. L. & ZHANG, Y. 2005. Comparison of GPS radio occultation soundings with radiosondes. Geophysical Research Letters, 32. LIOU, Y. A., PAVELYEV, A. G., LIU, S. F., PAVELYEV, A. A., YEN, N., FLUANG, C. Y. & FONG, C. J. 2007. FORMOS AT-3/COSMIC GPS radio occultation mission: Preliminary results. Ieee Transactions on Geoscience and Remote Sensing, 45, 3813-3826. MEANS, J. D. & CAYAN, D. 2013. Precipitable Water from GPS Zenith Delays Using North American Regional Reanalysis Meteorology. Journal of Atmospheric and Oceanic Technology, 30, 485-495. PAVELYEV, A. G., LIOU, Y. A., WICKERT, J., SCHMIDT, T., PAVELYEV, A. A. & LIU, S. F. 2007. Effects of the ionosphere and solar activity on radio occultation signals: Application to CHAllenging Minisatellite Payload satellite observations. Journal of Geophysical Research-Space Physics, 112. PAVELYEV, A. G., ZHANG, K. F., LIOU, Y. A., PAVELYEV, A. A., WANG, C. S., WICKERT, J., SCHMIDT, T. & KULESHOV, Y. 2013. Principle of Locality and Analysis of Radio Occultation Data. Ieee Transactions on Geoscience and Remote Sensing, 51, 3240-3249. VOMEL, H., SELKIRK, H., MILOSHEVICH, L., VALVERDE-CANOSSA, J., VALDES, J., KYRO, E., KIVI, R., STOLZ, W., PENG, G. & DIAZ, J. A. 2007. Radiation dry bias of the vaisala RS92 humidity sensor. Journal of Atmospheric and Oceanic Technology, 24, 953-963. WANG, J. H., ZHANG, L. Y., DAI, A., VAN HOVE, T. & VAN BAELEN, J. 2007. A near-global, 2-hourly data set of atmospheric precipitable water from ground-based GPS measurements. Journal of Geophysical Research-Atmospheres, 112. YAN, X., DUCROCQ, V., POLI, P., HAKAM, M., JAUBERT, G. & WALPERSDORF, A. 2009. Impact of GPS zenith delay assimilation on convective-scale prediction of Mediterranean heavy rainfall. Journal of Geophysical Research-Atmospheres, 114.